English Shaker, German Maker – New Kitchen Style Comes To KDC! Kitchen Design Centre is pleased to announce that it will now be offering its customers a range of Shaker style kitchens by German luxury kitchen manufacturer Hacker. Billed by Hacker as “English-inspired cabinetry with German precision manufacturing”, the new Shaker range boasts elegant contours, a neat combination of function and form, and the chance to incorporate a range of innovative storage solutions for the perfect, practical kitchen. By combining the simplicity, functionality and sturdy construction that have long been the hallmarks of Shaker kitchens with the smooth curves of modern German kitchen design, Hacker has created a kitchen range that will complement the most traditional or modern home. The rounded edges available in the range are ideal for maximising the flow of space in any room, but most particularly in rooms with an island or prominent work area,where angular designs could feel intrusive and cluttered.The intuitive design of Hacker’s new Shaker range resolves this issue while making the most of the available space. Customers opting for the collection, which comes with a fine wood-grain finish, can choose from one of nine complimentary painted colours – from classic white, chic vanilla and saffron yellow all the way through to the bolder statement colours of midnight blue and crimson. “The new German Shaker-style kitchen range has been chosen to complement our existing range of Traditional English kitchen designs. 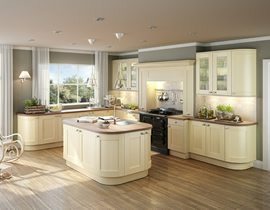 “While English design tends to be more grounded in the traditional, country-style kitchen, German designs are usually more linear and sleek. “This new range by Hacker combines the best elements from both English and German design, incorporating those rustic elements in a subtle way and finishing off with smooth lines and curves. The classic look of Kitchen Design Centre’s carefully selected Shaker kitchens blends beautifully with our range of stunning granite worktops, also available in a variety of colours for you to choose from. And, with the latest high quality Neff kitchen appliances to choose from, including the innovative and unobtrusive Slide&Hide® oven door, customers at Kitchen Design Centre can ensure that the finishing touches to their kitchen complement the look and feel of their room in the best way possible. To find out more about the new range of Hacker German Shaker kitchens available at Kitchen Design Centre, or to book in for a free design consultation for your kitchen, visit your nearest Kitchen Design Centre showroom today. Note: the full range of colours available in the new German Shaker range: white, magnolia, vanilla, saffron yellow, cashmere, beige grey, agate blue, midnight blue and crimson. The cabinets can also be delivered primed and ready to paint.